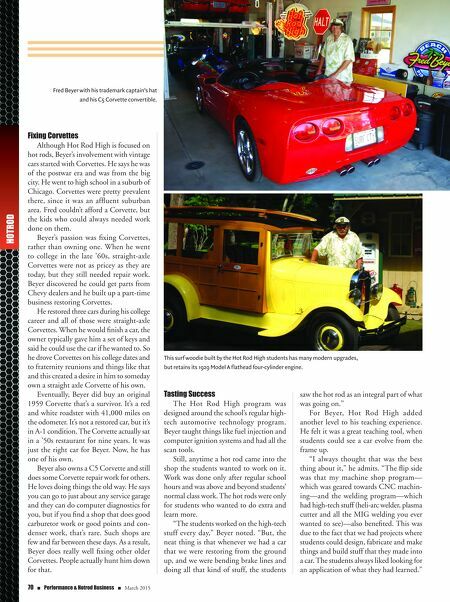 70 n Performance & Hotrod Business n March 2015 HOTROD Fixing Corvettes Although Hot Rod High is focused on hot rods, Beyer's involvement with vintage cars started with Corvettes. He says he was of the postwar era and was from the big city. He went to high school in a suburb of Chicago. Corvettes were pretty prevalent there, since it was an affluent suburban area. Fred couldn't afford a Corvette, but the kids who could always needed work done on them. Beyer's passion was fixing Corvettes, rather than owning one. When he went to college in the late '60s, straight-axle Corvettes were not as pricey as they are today, but they still needed repair work. Beyer discovered he could get parts from Chevy dealers and he built up a part-time business restoring Corvettes. He restored three cars during his college career and all of those were straight-axle Corvettes. When he would finish a car, the owner typically gave him a set of keys and said he could use the car if he wanted to. So he drove Corvettes on his college dates and to fraternity reunions and things like that and this created a desire in him to someday own a straight axle Corvette of his own. Eventually, Beyer did buy an original 1959 Corvette that's a survivor. It's a red and white roadster with 41,000 miles on the odometer. It's not a restored car, but it's in A-1 condition. The Corvette actually sat in a '50s restaurant for nine years. It was just the right car for Beyer. Now, he has one of his own. Beyer also owns a C5 Corvette and still does some Corvette repair work for others. He loves doing things the old way. He says you can go to just about any service garage and they can do computer diagnostics for you, but if you find a shop that does good carburetor work or good points and con- denser work, that's rare. Such shops are few and far between these days. As a result, Beyer does really well fixing other older Corvettes. People actually hunt him down for that. Tasting Success The Hot Rod High program was designed around the school's regular high- tech automotive technology program. Beyer taught things like fuel injection and computer ignition systems and had all the scan tools. Still, anytime a hot rod came into the shop the students wanted to work on it. Work was done only after regular school hours and was above and beyond students' normal class work. The hot rods were only for students who wanted to do extra and learn more. "The students worked on the high-tech stuff every day," Beyer noted. "But, the neat thing is that whenever we had a car that we were restoring from the ground up, and we were bending brake lines and doing all that kind of stuff, the students saw the hot rod as an integral part of what was going on." For Beyer, Hot Rod High added another level to his teaching experience. He felt it was a great teaching tool, when students could see a car evolve from the frame up. "I always thought that was the best thing about it," he admits. 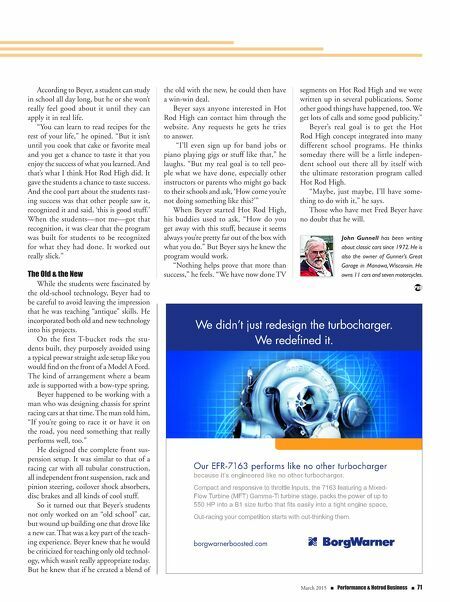 "The flip side was that my machine shop program— which was geared towards CNC machin- ing—and the welding program—which had high-tech stuff (heli-arc welder, plasma cutter and all the MIG welding you ever wanted to see)—also benefited. This was due to the fact that we had projects where students could design, fabricate and make things and build stuff that they made into a car. The students always liked looking for an application of what they had learned." This surf woodie built by the Hot Rod High students has many modern upgrades, but retains its 1929 Model A flathead four-cylinder engine. Fred Beyer with his trademark captain's hat and his C5 Corvette convertible.